Swedish Massage promotes relaxation and eases muscle tension through the use of moderate pressure to the muscle tissues. Sports Massage is similar to deep tissue specifically centered on muscle groups with more muscle specific stretching incorporated into the massage. Prenatal Massage to help promote wellness and reduce stress. Massage Therapy enhances the function of muscles and joints, improves circulation and general body tone, and relieves mental and physical fatigue. Hot Stone Massage melt your stress away with the warmth of heated stones. The hot stones are used to retain heat which soaks deeply into the muscles, releasing tension. Reflexology is the art of healing the body through the reflex zones of the body – focusing on the hands and feet. Lymphatic Drainage is beneficial to those who suffer from allergies, have swelling/edema/gout, have recently had surgery. Helping the Lymphatic System to clear toxins and extra fluids from the body’s tissues. Scalp Massage with Oils relaxing and invigorating massage using oils and hot compresses that help relieve headaches and condition the hair and scalp. Sinus Relief Massage to help relieve sinus congestion. Uses acupressure and lymphatic drainage along with hot compresses for a most relaxing and uplifting experience. Chair Massage only have a moment to pamper yourself, chair massage is a fully clothed introduction to massage, primarily back , and shoulders are worked. Aroma Therapy Body Wrap using aromatherapy, massage and heat. Helps relieve sore muscles, as well as, moisturizes and nourishes the skin. Your choice of Aromatherapy oil or blend. Detox Body Care refresh and detox. Seaweed gel wrap followed by a light massage with Hydrating lotion. Slimming Wrap using three techniques to break up cellulite; an exfoliating cellulite reduction, and seaweed gel wrap with cellulite reduction essential oil blend. *Seaweed, due to its iodine content, helps increase the metabolic rate, activating the exchange of substances and eliminating toxins. The amino acids found in seaweed aid in tissue development and mineral salts act on cell vitality, moisturizing dry and sensitive skin. 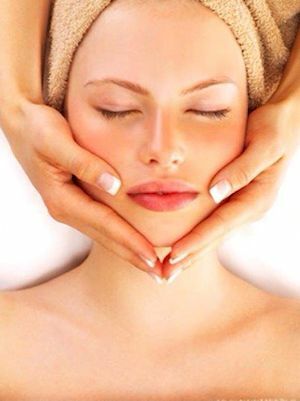 Facial treatments include a variety of different exfoliation techniques such as the use of enzymes, chemical exfoliations, and other gentle and hydrating treatments and products that are selected for your particular skin care type and concerns.